Interception is a design goal that relates to the prevention of runoff from the site from the initial depth of rainfall of a storm. Preventing runoff from, for example, the first 5 mm of a storm can be achieved by using the runoff as a source of water (ie. rainwater harvesting), or by infiltrating it and also using available evapotranspiration and evaporation processes. Why is Interception so important? Small to moderate storms tend to be the primary cause of degradation in urban watercourses. In rural or greenfield catchments, these storms would generate little or no immediate runoff, with most of the runoff seeping into the soils. Much of this infiltrated moisture will then evaporate from the catchment or be used by plants and often only a small fraction will slowly find its way to receiving waterbodies – supporting the continuous base flows. In urban catchments where Interception has not been considered, the same storms generate immediate runoff for all events, causing erosion and other morphological change, damaging ecosystems, and delivering loads of pollutants to receiving waters. Intercepting just 5mm of most storms – large or small, has profound implications for both the management of surface water runoff quality and quantity. Interception, allows the site’s hydrological response to more closely approximate greenfield conditions in terms of runoff volume and frequency of discharges, whilst delivering significant reductions in polluted runoff – preserving the natural morphology and enhancing quality. Statistically, over 50% of storms produce less than 5mm of rainfall, therefore intercepting just 5mm means the majority of storms will create no runoff at all. Why is there a perception that the delivery of Interception might be difficult? To date, there has been a lack of guidance and simple design approaches to determine how to practically deliver Interception. 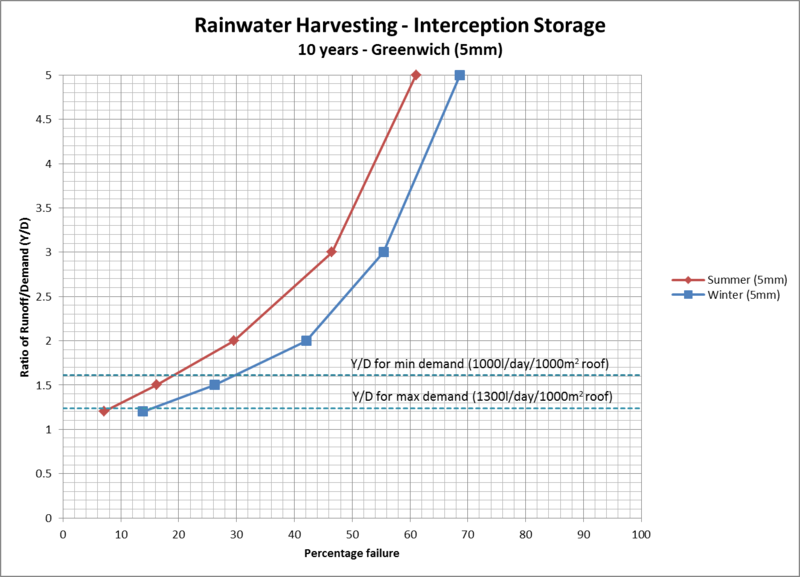 This has driven the perception that, for sites where infiltration rates are low or where the extent of impermeable area is large – Interception design will prove too problematic and costly to implement, despite being conceptually desirable. In addition, when the weather is particularly inclement, saturated ground conditions can occur (note: this could happen at any point of the year though it tends to happen more frequently in winter). During such periods, infiltration, evaporation and evapotranspiration processes may be low or negligible and therefore Interception systems may not function effectively. What has the research demonstrated? An early outcome has been the production of a practical methodology by which Interception might be evaluated and required on a site. Rather than an absolute requirement to address every single event, the methodology presents a flexible approach that takes account of the random nature of rainfall and the need to protect the environment during summer (when the receiving waterbody is likely to be at its most vulnerable). The methodology suggests that a probabilistic approach is used which sets one or more statistical compliance levels e.g. Interception is delivered for a certain proportion of events on an annual basis, or a higher proportion during summer months and a lower proportion during winter months. This study has proposed that an appropriate level of compliance might be 80% delivery for events in the summer and 50% during the winter. Crucially, the study has shown that this is likely to be quite feasible for the majority of sites across the UK using systems that do not take a large amount of space on a site (and are therefore not likely to make the development unviable). What do the research results look like? The results of Interception performance for two SuDS components (rainwater harvesting systems and swales) are presented here. Further SuDS components (including permeable pavements) are presented in the report. Rainwater harvesting enables rainfall to be treated as resource. Common uses include toilet flushing, washing and irrigation. Figure 1 shows the extent of likely compliance for summer and winter conditions. It shows that the degree of compliance is linked closely to the ratio of rainfall yield to the non-potable water demand. Here a compliance level of 80% in summer requires a yield to demand ratio of 1.65:1 – put another way 60% of the water that is captured and stored has to be used. 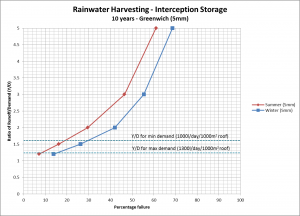 This simple criteria allows for easy analysis and design of a rainwater harvesting system to provide Interception capability. Swales can provide Interception, together with significant treatment benefits, and amenity value. Whilst often used for conveyance purposes, even low infiltration levels together with the provision of minimal storage, can provide Interception for large areas of impermeable surface. In Figure 2, a 200mm storage depth swale is analysed assuming an impermeable collection area ratio of 50:1. As such a 2m wide swale 10m long might serve a connecting area of some 1000m2. The infiltration rate assumed was 1×10-5m/s which is a relatively low. 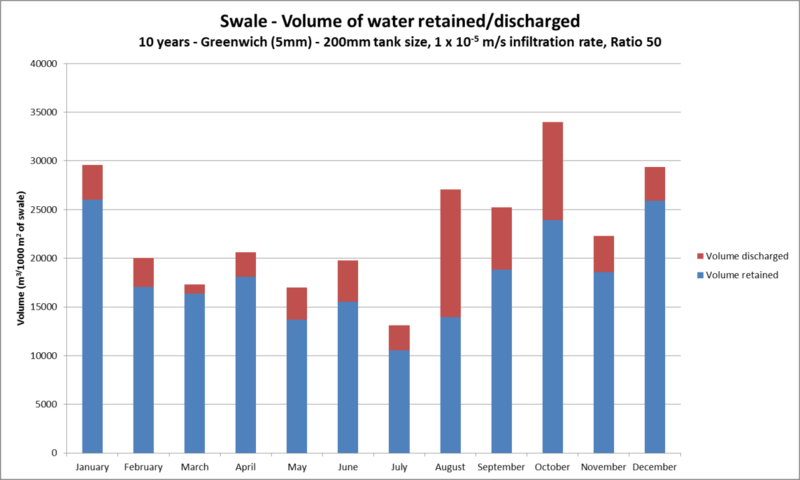 The swale not only complies with the 80% and 50% summer and winter criteria, but this graph shows how much water is lost by evaporation and infiltration, with only 5% (March) to 40% (August) of the total runoff leaving the site. This shows that the delivered Interception is providing very effective morphological protection of receiving streams. 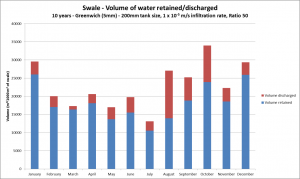 The report also details the performance of swales for storage depths of only 100mm and lower rates of infiltration. How could this research be taken forward further? This flexible approach promotes Interception as a fundamental principle of sustainable drainage. It illustrates that rainwater harvesting provides more than resource conservation and provides a pragmatic method for using a range of SuDS to achieve compliance with an appropriate Interception criterion. A fully developed tool based on this approach would facilitate assessment of drainage scheme proposals by the forthcoming SABs as well as those designing drainage systems. For a copy of the main report “MAR7091-RT001 Interception storage analysis for roofs and roads” please visit www.hrwallingford.com/publications ‎.